With this new feature, up to 63 different injection molds can be connected to a single TTC hot runner controller, and the controller can automatically identify the operating parameters for each individual mold. All operating data for each mold is stored in the controller, and a menu shows operators exactly how each tool needs to be controlled. This new feature is available on Gammaflux TTC controllers with a PC-based operator panel (touchscreen interface). Using an Ethernet connection, the TTC connects with a digital input mold reading module. The recipe can be identified with either a mold key or a cable that attaches to the mold. Mold ID software is loaded into the TTC to operate this new function. Existing TTC controllers in the field can be easily retrofitted to accept Mold ID. 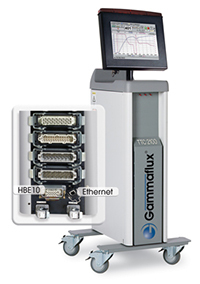 Gammaflux Triangulated Control Technology® provides fast startup and tight, accurate temperature control, which leads to improved molding performance and better quality parts on even the most challenging applications.